I was packing the car to come back into the city when I paused to toss an acorn for the little cat. As I scanned the ground for more nuts, I saw something that made me thrill: a Shaggy Mane! I've always heard about the shaggy mane (Coprinus comatus)...its distinctive form, its unique method of scattering spores, and its rapid descent from primo edible to squishy mess. There's no mistaking the long, closed-parasol shape of the shaggy mane. Its stem is hollow and 2-6 inches long. Its cap can also be 2-6 inches long and is covered with white scales (hence the shagginess) that come off when rubbed. As the cap opens, its gills turn from white to black with legendary speed; once black, they dissolve into sliminess. 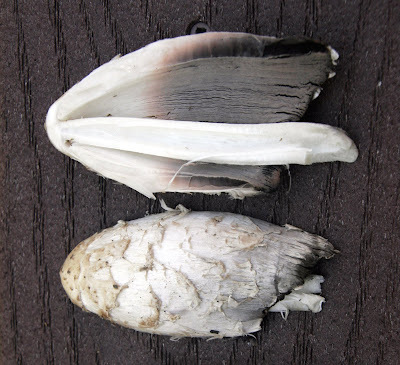 Unlike most mushrooms, which drop their spores out of gills or pores, the gills of the shaggy mane deliquesce. What a wonderful word. It means to dissolve or melt away, to become soft or liquid with maturity. A shaggy mane can deliquesce in a single day. Mushroom experts says to cook this mushroom immediately because it becomes inedible in just a few hours. One of mine was completely closed (maximum deliciousness), but the other had already started to turn. So I postponed my departure for the City (because I have my priorities straight), trimmed the blackening gills, and cooked up the fresh, white parts. Instead of throwing away the deliquescing gills (I can't stop saying that word!) I placed them on the lawn near where I'd found the fungus, in an effort to spread the spores. This isn't a woodland mushroom. It comes up in lawns, on gravel roads, in hard-packed ground. Shaggy manes are notorious for appearing in vast quantities in cool weather. They're predicting the first frost in Shohola tonight, and I'm hoping for more shaggy manes when I get back next Thursday. The taste and texture are delicate and enticing...after just a few bites, I want more. P.S. I apologize for not having a photo of advanced deliquescence; perhaps I'll be able to add one next weekend. In the meantime, check out the photos here. He doesn't share my enthusiasm for eating wild fungi, but it's an excellent blog and he takes great photos. Keep your eyes out for more. I was seeing them all over a week or so ago up here so I imagine they are 'in season' down your way now. Oooh, I love shaggy ink caps! I think they taste a little like - um, I hope no one throws up here - roasted bone marrow. When I stayed at Sean & Jenny's house in Mass. in Oct. '06 there were shaggy manes popping up in front of the house. I mentioned them to S & J and they said, "Are you going to eat them? We'd read you could but weren't sure." I replied, "Just did." Thanks Wiseacre, I will. I have a big foraging day planned for Saturday and I'm hoping mushrooms will be a big part of the resulting feast. Marie, I'm intrigued...I've never tasted bone marrow, roasted or otherwise. But now I'm curious, and not at all inclined to throw up! I think Prune may still serve roasted bone marrow...on 1st Street/1st Ave. Very rich, good on toast. Also Minetta Tavern. they look like little birds. gorgeous.